This paper aims to examine how EU agencies could be of significance in the ..... Safety and Health at Work and the European Monitoring Centre for Drugs and. Jan 18, 2002 - 2001 Tanja A. BÃ¶rzel. Printed in Italy in ...... On Environmental. Leader and Laggards in the EU', Journal of European Public Policy 7 (1):. Email contact: Nicole. ... bring additional revenues to demand response providers and improve incentives to put in place .... The provision of ancillary services is generally risk-free because a part of the remuneration is associated to the. If cited or quoted, reference should be made to the full name of the author(s), ...... to successfully portray Italy as a democracy under siege with the Red Brigades. EUROPEAN UNIVERSITY INSTITUTE, FLORENCE. MAX WEBER .... make it difficult to decline such requests (Ballard 1990; Shaw 2001). The arrangement of. The nominal rate time series is divided by 4 to obtain quarterly data. ...... 4.185. 4.1766. Real wages. 1Q. 1.0549. 1.2292. 0.801. 0.7475 0.7753. 4Q. 0.9364. 0.959 ..... 0.93 3.70. 2.48. 0.00. 11.19 20.97 1.18. 15.63. Inflation. 5.28. 0.00. 4.97.
such network services is still under debate. In this view, in USA ..... The virtual hub approach implies that the market uses a commercial network, for most of the. development of the democratic State, and while it has lost its exclusivity on account of ... system, European lawyers must consequently âserve many mastersâ. 32. WHAT IS THE DIGITAL INTERNAL MARKET AND WHERE THE EUROPEAN UNION SHOULD INTERVENE? This text may be downloaded only for personal research purposes. Additional reproduction for other purposes, whether in hard copies or electronically, requires the consent of the author(s), editor(s). If cited or quoted, reference should be made to the full name of the author(s), editor(s), the title, the working paper, or other series, the year and the publisher. Abstract This paper analyses the digital internal market and when EU intervention is needed to achieve this internal market. It sets legal and economic criteria to determine the appropriate scope of the EU intervention. It applies these criteria to several case studies and concludes that sometimes the EU intervention is not justified (choice of regulatory remedies in many national markets, regulation of mobile termination rate, price control of Next Generation Access networks), whereas in other cases EU intervention is justified (entry regulation, international roaming, spectrum). The paper calls for a more open debate of the concept and the means to achieve the digital internal market. It also submits that EU intervention should focus on the areas where its benefits are the highest (in particular given the possibilities of economies of scale provided by the technology or the cross-country externalities), and where its costs are the lowest (in particular given the heterogeneity of national preferences or the need for regulatory experimentation and competition). Therefore, EU intervention is more relevant for the content part of digital regulation (such as copyright, privacy, electronic commerce, dispute resolution) than for the infrastructure part (i.e. the electronic communications networks and services). In particular, this paper calls the Commission to use with extreme caution its new power on regulatory remedies, especially in the context of the deployment of NGA, given the uncertainty on the best form of regulation. An earlier version of this paper was presented at the 30the Anniversary Conference of the CRID held in Namur (Belgium) on 21 January 2010 and has benefits from the comments of the participants. The authors would also like to thank Robert Queck for his very useful comments. Communication from the Commission of 26 August 2010, A Digital Agenda for Europe, COM(2010) 245/2. Communication from the Commission of 13 April 2011, The Single Market Act, COM(2011) 206. Monti (2010: 44-46). With regard to telecommunications services and infrastructures, the Report recommends a review of the sector to prepare proposals for creating a seamless regulatory space for electronic communications, including proposals to reinforce EU level regulatory oversight, to introduce pan-European licensing and EU level frequency allocation and administration. On such issue, see Commission Services Impact Assessment of 28 June 2006 on the Review of EU regulatory framework for electronic communications networks and services, SEC(2006)817, p. 19-21, and Nicolaides (2006, p. 5). 2. The internal market in electronic communications and the optimal level of regulation When dealing with the internal market, two related issues should be distinguished. First, what is the internal market and what does it imply for public policy at national and EU level? Secondly, what is the optimal level of regulation (between the national and the EU levels) to achieve the internal market? 2.1. 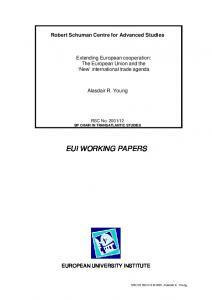 The concept of the internal market in electronic communications and the required public policies for its establishment Article 26(2) of the Treaty on the Functioning of the European Union (TFEU) states that The internal market shall comprise an area without internal frontiers in which the free movement of goods, persons, services and capital is ensured in accordance with the provisions of the Treaties. The achievement of such internal market requires some public policies at the national as well as at the EU levels. We can find some indications in Article 8(3) of the amended Framework Directive5, which provides that The national regulatory authorities shall contribute to the development of the internal market by inter alia: - removing remaining obstacles to the provision of electronic communications networks, associated facilities and services and electronic communications services at European level; - encouraging the establishment and development of trans-European networks and the interoperability of pan-European services, and end-to-end connectivity; - cooperating with each other, with the Commission and BEREC so as to ensure the development of consistent regulatory practice and the consistent application of this Directive and the Specific Directives. Directive 2002/21 of the European Parliament and of the Council of 7 March 2002 on a common regulatory framework for electronic communications networks and services, OJ  L 108/33, as amended by Directive 2009/140. Directive 98/61 of the European Parliament and of the Council of 24 September 1998 amending Directive 97/33 with regard to operator number portability and carrier pre-selection, OJ  L 268/37. the Member States an obligation to implement Carrier Pre-Selection (CPS) by 2000. The UnitedKingdom, with a tradition of facilities-based competition, strongly opposed CPS as it was removing an incentive for operators to invest in local loops. The UK was outvoted in the Council and was forced to implement CPS. Whether the UK was right to oppose CPS is a matter of opinion. What is difficult to understand is why the British preference for a stronger incentive to investment in the local loop was an obstacle to the achievement of the internal market and why the country had to be brought in line. - National preferences may also relate to social policies. It is appropriate to let the Member States decide on the scope of the digital services of general economic interest they want to make affordable to their citizens. Moreover, the achievement of the internal market should not be expected to lead to the harmonisation of prices.7 Indeed, national differences in population density, GDP per capita, industry history and structure, consumer preferences and the fact that most electronic communications services are not tradable between Member States (thereby impeding any possibility of arbitrage) will inevitably result in differences in prices. To be sure, the prices of electronic communications services are geographically averaged across the national territory in most Member States although there are regional cost differences between, say, urban and countryside areas. However, this similarity in price is due to a political decision to impose geographic tariff averaging for social and territorial cohesion reasons among each Member State. The level of solidarity at EU level can not justify a similar EU averaging. 2.2. The justification of an intervention at the EU level The second issue is to determine when an intervention at the EU level is justified to achieve the internal market. 2.2.1. 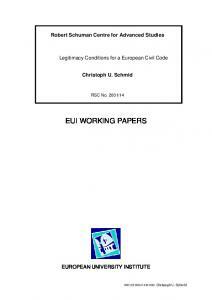 The legal criteria In EU law, an intervention at the European level is justified when it passes two successive tests, the legal basis test (in particular the legal basis related to the internal market) and the subsidiarity test.8 The legal basis test determines whether the EU has a competence to act, whereas the subsidiarity test determines whether the existing competence may be exercised, hence the former should be run before the latter. The internal market legal basis, Article 114(1) TFEU, provides that The European Parliament and the Council shall (…) adopt the measures for the approximation of the provisions laid down by law, regulation or administrative action in Member States which have as their object the establishment and functioning of the internal market. abstract risk of infringements of fundamental freedoms or distortion of competition is not sufficient to justify the choice of Article [114 TFEU] as a legal basis, the Community legislature may have recourse to it in particular where there are differences between national rules which are such as to obstruct the fundamental freedoms and thus have a direct effect on the functioning of the internal market (…) or to cause significant distortions of competition (…). 33. Recourse to that provision is also possible if the aim is to prevent the emergence of such obstacles to trade resulting from the divergent development of national laws. However, the emergence of such obstacles must be likely and the measure in question must be designed to prevent them (…). The Court of Justice follows the same line of reasoning in the ENISA case, the other case where the limits of Article 114 TFEU were tested in the electronic communications sector, by judging that10 : (…) that provision is used as a legal basis only where it is actually and objectively apparent from the legal act that its purpose is to improve the conditions for the establishment and functioning of the internal market. If the legal basis test is met, then the subsidiarity test should be examined. Article 5(3) of the Treaty on the European Union (TEU) provides that: the Union shall act only if and in so far as the objectives of the proposed action cannot be sufficiently achieved by the Member States, either at central level or at regional and local level, but can rather, by reason of the scale or effects of the proposed action, be better achieved at Union level. First, the relationship between the legal basis test and the subsidiarity test is complex because both tests have a different objects (determine whether there is an EU competence, and then whether this competence may be exercised), but same elements may be used to prove both tests. This was clear in the International roaming regulation case where the trans-national aspect of international roaming was used both in the legal basis and in the subsidiarity tests. Second, both legal tests give some flexibility to the EU institutions to determine their competences. To use this flexibility in the most efficient way, some economic criteria may be useful, on which we now turn. 2.2.2. The economic criteria To determine the economic criteria justifying an efficient EU intervention, we rely upon the theory of fiscal federalism which aims to find the optimal level of governance and public intervention.11 According to such theory, there are several benefits to centralisation (read EU intervention) which are of substantive and institutional nature. The substantive benefits are:12 1. The internalization of the cross-country externalities; there is such externality when the regulation (or the absence of regulation) in country A has significant effect on the welfare of the consumers and/or firms in country B and that effect will not be taken into account by the regulator of country A. One example is the regulation of international roaming. Case C-217/04, United Kingdom v. European Commission and Council, ECR  I-3771, para.42. Alesina, A., Angeloni, I, Schuknecht L. (2005), Oates (1999) and (2005), Pelkmans (2005), Tabellini (2003). For an application in telecommunications, see Barros (2004), Cave and Crowther (1996), Haucap (2009a: 466-472), Nicolaides (2006). We do deal with the issue of regulatory race to the bottom, rarely applicable in electronic communications as the electronic communications networks and services are not tradable across countries. ERG (2006, p. 11). For instance European Evaluation Consortium (2007, p. 21-24) which does a cost-benefit analysis of the harmonisation of remdies without taking into account the benefit of regulatory experimentation. Ovum and Indepen (2005: Section 6). See Eurostrategies and Cullen International (1999). may entail trade-offs among efficiency arguments or between efficiency and social arguments. Moreover, this choice is complicated by an endogeneity issue as the level of governance impacts on the costs and benefits of centralisation. Thus, centralisation may stimulate more central economic activities which, in turn, will justify more centralisation. Those dynamic and endogenous effects are particularly relevant in the European Union where some harmonisation measures were imposed for, and led to, more Europeanization of business or citizen relationships (think of the effects of the Erasmus student exchange programmes). Note that in general, stakeholders are less keen of centralization than the Commission Eurostrategies/Cullen International (1999), Hogan & Hartson and Analysys (2006, p. 91). Alesina, Angeloni and Etro (2001) discuss the possibility of a centralization bias in the Union. Art. 7(3) of the amended Framework Directive 2002/21. Recital 38 of the original Framework Directive 2002/21. Art. 7(4) and (5) of the amended Framework Directive 2002/21. Art. 19(1) of the amended Framework Directive 2002/21. market analyses22 without really investigating the effects on trade between Member States on a case by case basis. Moreover during its review, the Commission in practice conducts a consistency check between the different approaches of the NRAs rather than investigating whether the differences between NRAs’ measures are such as to obstruct the fundamental freedoms, and thus have a direct effect on the functioning of the internal market or to cause significant distortions of competition (to paraphrase the Court of Justice). In its last Report on the market review process, 23 the Commission notes that Regulatory remedies still vary across Europe, even where the underlying market problems are very similar. This is a serious impediment to achieving a true single market. See Commission Guidelines of 9 July 2002 on market analysis and the assessment of significant market power under the Community regulatory framework for electronic communications networks and services, OJ  C 165/6, para.147 stating that “the notion of an effect on trade between Member States is likely to cover a broad range of measures”. So far, all NRAs draft decisions have been notified to the Commission for comments. Communication from the Commission of 1 June 2010 on market reviews under the EU Regulatory Framework (3rd Report), COM(2010) 271, p. 4. See also the Opinion of Advocate General Poaires Maduro in Case C-58/08, Roaming Regulation, para.18. In this sense also, Larouche and de Visser (2006) stating that, “the Commission should intervene only when the draft measure proposed by an NRA is such that it will hamper the internal market (on the basis of concrete evidence) or that it will significantly conflict with Community law. A mere divergence of opinion between the Commission and the NRA (or between NRAs) is not sufficient to justify a Commission veto”. Article 2(b) of the amended Framework Directive defines that ‘transnational markets’ as covering the Community or a substantial part thereof located in more than one Member State. For an assessment of the cost and benefits of an EU intervention on trans-national services, see European Evaluation Consortium (2007, p. 25-27 and 31-33). Decision 626/2008 of the European Parliament and of the Council of 30 June 2008 on the selection and authorisation of systems providing mobile satellite services (MSS), OJ  L 172/19, and Commission Decision 2009/449 of 13 May 2009 on the selection of operators of pan-European systems providing mobile satellite services (MSS), OJ  L149/65. The two operators selected are Solaris and Europasat. Solaris Mobile is experiencing some technical problems which limit the bit rate on the uplink. Europasat satellite is still being built. On that issue, see BEREC Report of February 2011 on relevant market definition for business services, BoR (10)Rev1. Council Directive 87/372 of 25 June 1987 on the frequency bands to be reserved for the coordinated introduction of public pan-European cellular digital land-based mobile communications in the Community, OJ  L 196/85, and Council Recommendation 87/371 of 25 June 1987 on the coordinated introduction of public pan-European cellular digital land-based mobile communications in the Community, OJ  L 196/81. Until the early 90s, several standards of analogue mobile telephony co-existed NMT in the Nordics and Benelux, C-450 in Germany and Portugal, TACS in the UK, RC 2000 in France, RTMI in Italy… Commission Directive 96/2 of 16 January 1996 amending Directive 90/388 with regard to mobile and personal communications, OJ , L 66/36. Art. 9(1) of the amended Framework Directive 2002/21. Communication from the Commission of 7 December 2000, Sixth Report on the Implementation of the Telecommunications Regulatory Package, COM(2000) 814. Art. 7(2) of Directive 97/33. Denmark, Germany, Luxembourg and Ireland. Commission Recommendation 2003/311 of 11 February 2003 on relevant product and service markets within the electronic communications sector susceptible to ex ante regulation, OJ  L 114/45. See, among others, Pelkmans and Renda (2011). Commission Recommendation 2009/396 of 7 May 2009 on the Regulatory Treatment of Fixed and Mobile Termination Rates in the EU, OJ  L 124/67. at the Communications Committee.39 The Commission states that, to determine the minimum efficient scale for the purposes of the cost model, and taking account of market share developments in a number of EU Member States, the recommended approach is to set that scale at 20 % market share. Furthermore, even the Commission acknowledges that asymmetry can be justified for a period of up to four years after market entry. Other parties point out that there are very few, if any, examples of a number 3 or 4 entrant in an EU market ever gaining the second largest market share in revenues. Therefore, a longer transition period is needed in the interest of long term competition. The Commission justified its intervention to ensure legal certainty and the right incentives for potential investors.40 However, the discussion above shows that there are two respectable schools of thought,41 with valid arguments on both sides, hence regulatory experimentation by Member States is justified. Moreover, there are no counterbalancing arguments justifying EU regulation as it is hard to see why a difference of say 25% in the MTRs of two mobile operators in the same country aimed at balancing interconnecting payments could have a material effect on the internal market. Similarly, Haucap (2009b:30) states that: It is simply unrealistic to assume that the regulation of MTRs would be used as a tool of strategic regulatory policy by NRAs. Hence, cross-border externalities provide no economic justification for harmonising MTR regulation at a European level. 12 against, 10 abstentions, and 5 in favour: Result of the vote at the Communications Committee of 18 February 2009. Recital 4 of the Recommendation 2009/396 on the Regulatory Treatment of Termination Rates. For a summary of the debate in the economic literature on the regulation of MTR, see Haucap (2009b:31). IRG/ERG Response of September 2008 to Public Consultation on Termination Rates, ERG(08) 31 rev1 stating that: “the development of the internal market (…) is best achieved by ensuring that national decisions are taken on the basis of shared principles, rather than requiring uniformity in the fine detail of the regulatory approach”. See Hoernig et al. (2011). See Williamson, Black and Wilby (2011). price control type, e.g. cost orientation, retail minus. Commission Recommendation 2009/396 on the Regulatory Treatment of Termination Rates. Commission Recommendation 2010/572 of 20 September 2010 on regulated access to Next Generation Access Networks (NGA), OJ  L 251/3. On the additional national flexibility given by each iteration of the Recommendation, see Cave and Shortall (2010). Named after the Case 120/78 Rewe Zentral c. Bundesmonopolverwaltung für Branntwein, ECR  649. Directive 2000/31 of the European Parliament and of the Council of 8 June 2000 on certain legal aspects of information society services, in particular electronic commerce, in the Internal Market, OJ  L 178/1, Art. 3. Directive 97/13 of the European Parliament and of Council of 10 April 1997 on a common framework for general authorisations and individual licences in the field of telecommunications services, OJ  L 117/15 Directive 2002/20 of the European Parliament and of the Council of 7 March 2002 on the authorisation of electronic communications networks and services OJ  L 108/21, as amended by Directive 2009/140. obtaining an authorisation has become much lighter than in the early 00s. Furthermore, compliance costs would be relatively equal under the three regimes since it is anyway the responsibility of each national regulator to undertake the surveillance of its own market. 3.2.2. International roaming In December 2000, the European Commission's Competition Directorate-General adopted a working document on the initial findings of its Sector Inquiry into mobile roaming charges.51 The Commission's view was that the international roaming market was not competitive as Inter-Operator Tariffs (IOTs) were set by the operators and are not subject to competition. IOTs had risen and have become much more closely aligned. The Commission's view was that this was not coincidental, but the result of collusion. Seven months later in July 2001, the same DG conducted dawn raids on nine mobile operators in Germany, the UK and the Netherlands. This did not lead to any Commission decision. The 2003 Commission recommendation on relevant markets identified a wholesale national market for international roaming on public mobile networks (market 17).52 Finland in 2005, followed by Austria, Denmark, Italy, Spain and Slovenia in 2006, all notified analyses pointing to an absence of any Significant Market Power position, whether single or joint. The Commission did not veto any decisions. However, in June 2006, in the comments on AGCOM’s, the Italian regulator, notification, the Commission noted that53 (…) it has not so far been possible, for a national regulator alone, also because of the cross-border nature of international roaming services, to act effectively to address the high level of wholesale international roaming charges. The Commission is therefore considering the adoption of EU measures to address the high international roaming prices. Working Document of DG Competition of 13 December 2000 on the Initial Findings of the Sector Inquiry into Mobile Roaming Charges. Commission Recommendation 2003/11 on relevant markets susceptible to ex-ante regulation. Commission Decision of 7 June 2006, Case IT/2006/0393. Regulation 717/2007 of the European Parliament and of the Council of 27 June 2007 on roaming on public mobile telephone networks within the Community and amending Directive 2002/21/EC, OJ  L 171/32, as amended by Regulation 544/2009 Case C-58/08, International roaming regulation, para.47. consumers, while domestic mobile operators suffer as do domestic consumers since – in response to a decrease in roaming revenues – other mobile telecommunications prices may increase or handset subsidies decrease due to the waterbed effect.56 Thus, we concur with the Court of Justice57 and note that paradoxically, one of the few cases where the competence of the EU to intervene in electronic communications regulation was contested before the Court was a case where, at least according to the principles of fiscal federalism, the optimal level of regulation was without doubt the EU level. We also observe that, while acknowledging the ‘dirigiste’ approach of the roaming regulation and its departures from the market-based approach promoted by the EU for other electronic communications services, it is fair to recognise that competition in this sector has so far failed. 3.2.3. Spectrum Another example of a positive EU intervention is the recently proposed decision on the Radio Spectrum Policy Program.58 One of the RSPP’s most important objectives is to complete the analogue terrestrial television switch-off by January 2012. In May 2010, the Commission adopted a Decision59 setting harmonised technical conditions for the use of the 800 MHz band for non-broadcasting services, in particular for mobile broadband services using 4G technologies such as LTE.60 The decision does not require Member States to open the 800 MHz band for non-broadcasting services but if/when a Member State does decide to, it must follow the technical conditions set by the Decision. The RSPP, however, would mandate the implementation of the decision to clear the 800 MHz band by January 2013. One of its main goals is to make spectrum available for wireless broadband services. This would support the ambitious goals set by the Digital Agenda for Europe whereby all Europeans have access to basic broadband by 2013 and at speeds of 30 Mbps or above by 2020. Also by 2020, half of all European households should be subscribers to broadband connections of 100 Mbps. Here we welcome the Commission’s policy because it clearly aims at achieving economies of scale for network equipment and handsets, at minimising the problems of spectrum interference across borders and therefore at lowering costs that will benefit consumers. 4. Conclusion To conclude, we think that the digital internal market should be fostered as it may benefit the EU economy and its citizens. However, we call for a solid and open debate on the definition of the digital single market and the appropriate policies at the national and EU level. Today, there are divergent views but no real debate on the conditions required to achieve the internal market. Haucap (2009a, p. 471). Such cross-countries externalities have been explicitly recognised by the the Opinion of Advocate General Poiares Maduro in Case 58/08 International roaming regulation, para. 27. The Advocate-General insists several time of the cross-border nature of roaming for the regulation to pass the legal basis and the subsidiarity test. For the opposite view, see Brenncke (2008). Commission proposal of 20 September 2010 for a decision establishing the first radio spectrum policy programme COM (2010) 471. Commission Decision 2010/267 of 6 May 2010 on harmonised technical conditions of use in the 790-862 MHz frequency band for terrestrial systems capable of providing electronic communications services in the European Union, OJ  L 117/95. The 800 MHz (790-862 MHz) band is the upper part of the spectrum that will be freed up with the switchover from analogue to digital terrestrial television broadcasting – the digital dividend. Then, Europe needs to define more precisely when EU intervention is justified and when it is not. It needs to define more clearly which national policies constitute an unacceptable fragmentation of the internal market and what is merely the expression of national preferences without any material impact on European welfare. It should do that on the basis of the legal criteria (the legal basis test –Article 114 TFEU- and the subsidiarity test), but also, and more importantly given the relative flexibility of the law, on the basis of the economic criteria provided by the theory of fiscal federalism. We submit that fostering the digital internal market does not mean that the EU should intervene in all parts of the regulation of the digital society. Any EU intervention should focus on the areas where its benefits are the highest, in particular given the possibilities of economies of scale provided by the technology or cross-country externalities, and where its costs are the lowest, in particular given the heterogeneity of national preferences or the need to allow for regulatory experimentation and competition. On that basis, we submit that EU intervention is more relevant for the content part of digital regulation (such as copyright, privacy, electronic commerce, dispute resolution) than for the infrastructure part (i.e. the electronic communications networks and services), as the former is based on tradable goods whereas the latter is mainly based on local non-tradable goods. At the infrastructure level, we submit that EU intervention should be concentrated on pan-European services (e.g. satellite communications) and international mobile roaming, spectrum, security and standardisation. Conversely, we think that EU intervention is not justified for national market analysis, especially for the choice of remedies when there is little impact on the single market and where there is uncertainty on the most appropriate regulatory approach. In particular, we submit that the Commission should use its new power on the choice of regulatory remedies with great care, showing each time why the choice of a particular remedy would affect trade between Member States and the single market. Such care is particularly relevant regarding the regulation of Next Generation Networks where uncertainty remains on the appropriate regulatory approach to stimulate investment, hence regulatory experimentation and competition would be useful. The development of electronic communications regulation in Europe has been fuelled so far by healthy competition between the Commission and national regulators. Over the years, depending on the issues, the EU or specific Member States have been in the driving seat in terms of generating new regulatory ideas. The battleground has been the legislative process, with the Council and the European Parliament striking the balance. But the battle has also been intellectual, with winning ideas trialled by the most innovative regulators being subsequently implemented in other countries. In addition, the EU should provide support for small regulators which so request.61 The regulatory framework is complex and regulators in small countries do not necessarily have the resources to meet their duty. That problem will become even more acute with the next wave of accession countries (Balkans). This is in line with Article 16(7) of the amended Framework Directive 2002/21, and Article 3(1c) of the Regulation 1211/2009 of the European Parliament and of the Council of 25 November 2009 establishing the Body of European Regulators for Electronic Communications (BEREC) and the Office, OJ  L 337/1. More generally see the new Art. 197 TFUE on administrative cooperation. References Alesina, A., Angeloni, I., Etro, F. (2001). 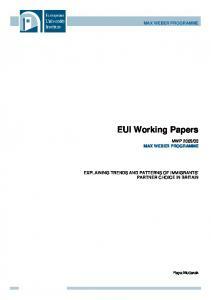 The political economy of international unions, CEPR Working Paper 3117. 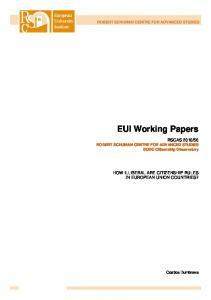 Alesina, A., Angeloni, I, Schuknecht L. (2005), “What does the European Union do?”, Public Choice 123, 275-319. Barros P.P. 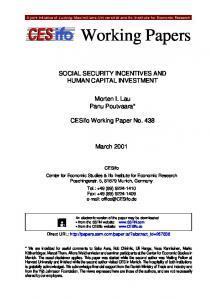 (2004), The Economics of EU’s Consultation Mechanism in Telecommunications, Mimeo. Brenncke M. (2008), “The EU Roaming Regulation and its non-compliance with Article 95 EC”, Working Paper of Martin-Lüther Universität. Cave M. and Crowther P. (1996), “Determining the level of regulation in EU telecommunications”, Telecommunications Policy 20, 725-738. Cave M. and Shortall T. (2010), The extended gestation and birth of the European Commission’s Recommendation on the regulation of NGAs”, in BEREC, Monitoring EU Telecoms Policy 2010, 16-24. Copenhagen Economics (2010), The Economic Impact of a European Digital Single Market, Report to the European Commission. 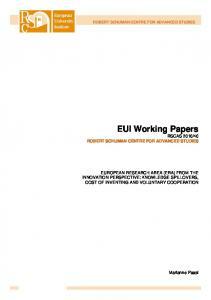 European Evaluation Consortium (2007), Cost-Benefit Analysis of Options for Better Functioning of the Internal Market in Electronic Communications, Study for the European Commission. European Regulators Group (2006), Effective Harmonisation within the European Electronic Communications Sector: A Consultation, ERG (06) 68. Eurostrategies/Cullen International (1999), The possible added value of a European Regulatory Authority for telecommunications, Study for the European Commission. Haucap J. (2009a), “The Regulatory Framework for European Telecommunications Markets between Subsidiarity and Centralization”, in Preissl, Haucap and Curwen (eds. ), Telecommunication Markets: Drivers and Impediments, Physica Verlag, 465- 481. Haucap J. (2009b), “The Recommended Regulation of Fixed and Mobile Termination Rates: A Critical Approach”, in NEREC (ed), Monitoring EU Telecoms Policy 2009, 27-33. Hoernig S., Jay S., Neu W., Neumannn K-H., Plückebaum T., Vogelsang I. (2011), Wholesale pricing, NGA take-up and competition, WIK Report for ECTA. Hogan & Hartson and Analysys (2006). Preparing the next steps in the regulation of electronic communications: A contribution to the review of the electronic communications regulatory framework. Study for the European Commission. Larouche P. and de Visser M. (2006), “The Triangular Relationship between the Commission, NRAs and National Courts Revisited”, Communications & Strategies 64, 125-145. Monti M. (2010), A new Strategy for the Single Market at the service of Europe’s economy and society, Report to the President of the European Commission. Nicolaides Ph. (2006). Regulatory Integration & Cooperation: The case of the European Regulators Group on Electronic Communications. Report to the ERG. Oates W. (1999), “An essay on fiscal federalism”, Jour. of Economic Literature 37(3), 1120-11149. Oates W. (2005), “Towards a Second-generation Theory of Fiscal Federalism”, International Tax and Public Finance 12, 349-373. OVUM and Indepen (2005), Applying the EU Regulatory Framework in microstates, A report to the CYTA, EPT and Maltacom. Pelkmans J. (2005), Testing for subsidiarity, BEEP Briefing 13, College of Europe, Brugge. Pelkmans J. and Renda A. (2011), Single eComs market? No such thing …, CEPS Policy Brief 231. Tabellini G. (2003), “Principles of policymaking in the European Union: an economic perspective”, CESifo Economic Studies 49(1), 75 – 102. Williamson B., Black D. and Wilby J. 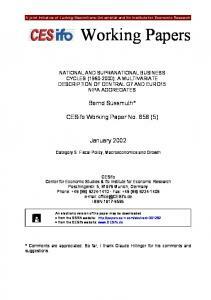 (2011), Costing methodology and the transition to next generation access, Plum Report for ETNO. 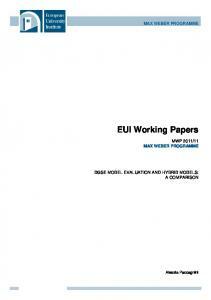 Report "EUI Working Papers - SSRN papers"